Hey gang! Don’t worry, I’ll let you in on what’s hiding behind that mysterious title in a little bit, but first I just wanted to let you know that I made another (two!) guest appearances on the Fantasticast podcast with Steve and Andy. The Fantasticast is all about the Fantastic Four, as you might imagine, but since the Marvel Universe is all kinds of connected, I’ve had the great honor of being invited whenever the FF and Daredevil collide. In the first of the two episodes I was in, we devote the entire 90 minutes to four issues of Daredevil (#36-39) that lead feature the FF and leads into Fantastic Four #73. The second episode is devoted to that very issue, which also features Daredevil. So check those out! Let’s get back on schedule. Today I’m looking at two scenes from Daredevil #93 (vol 1), by Gerry Conway and Gene Colan, for no other reason than that they are different kinds of hilarious. For some background information, this issue takes place when Daredevil and the Black Widow were sharing both the title and a rented house in San Francisco. 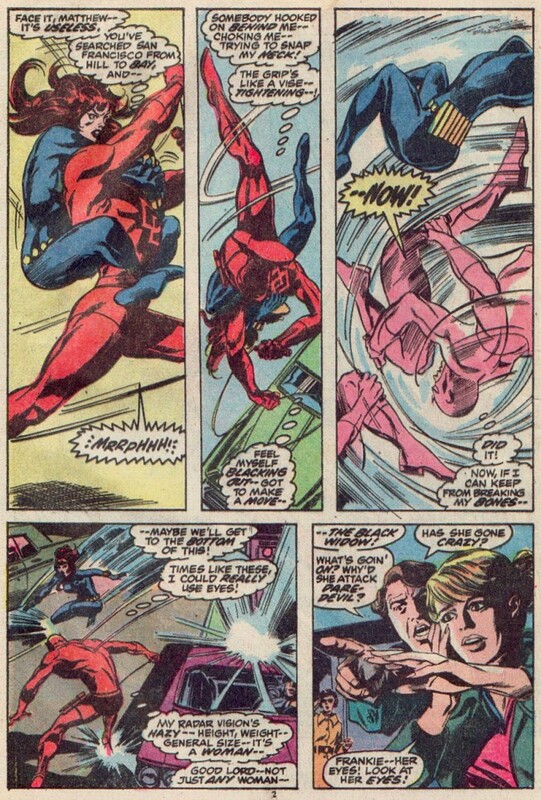 At the start of the issue, Natasha attacks Daredevil after having been hypnotized (along with old associate Danny French with whom she cooperated on the mysterious Project Four) by madman Damon Dran. 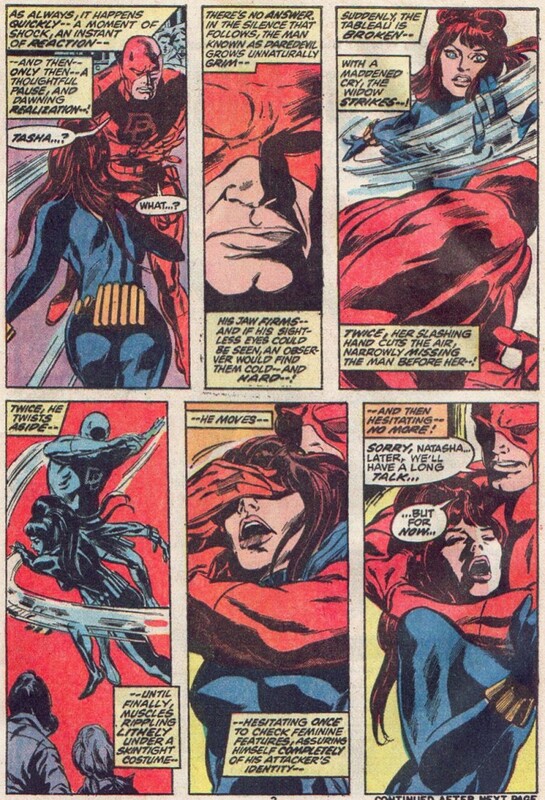 In a rather startling case of Daredevil being jumped from behind and not immediately recognizing Natasha – for some reason, he doesn’t use her heartbeat, and it would be another few years before Frank Miller came along and started actually using Matt’s nose – he attempts to figure out his attacker’s identity. This includes feeling the features of her face to make sure he’s really dealing with a woman. I don’t know about you, but I could think of others for him gather that kind of information. 😉 Either way, there’s something rather amusing about these two pages. Later in the same issue, Daredevil has managed to subdue his girlfriend and carry her back to their house. This is when he goes into full C.S.I. mode. You see, there’s mud underneath Natasha’s shoes. Mud! And it hasn’t rained in San Francisco in a really long time. And it’s not as if there are any sprinklers, lakes, fountains or any other sources of water within the city limits that might translate into local deposits of wet dirt. Obviously, she must have been in Oakland. Where it rains, apparently. Well, that’s it for now! See you later in the week for a review of Daredevil #4. Now, you didn’t miss the preview, did you? Oy. Silver Age madness indeed! I just want to say how much I’ve been loving this site, not just for helping me catch up on 50 years of continuity (especially those bits not yet available on Comixology/Marvel Unlimited), but also for fanfic resource help. So he gets back to the house with an unconscious Natasha and takes the time to put his sunglasses back on? I know its a dumb thing to notice amidst all the craziness, but its an odd detail that he takes off his mask to put his sunglasses on when no one is around. I guess he is really subconscious about his eyes. And congratulations on the podcast! I cant wait until the next installment of TOMP podcast! Those are always a joy to listen to. A well thought out and fun to read post. I don’t have a comment on the post but do have one the art. 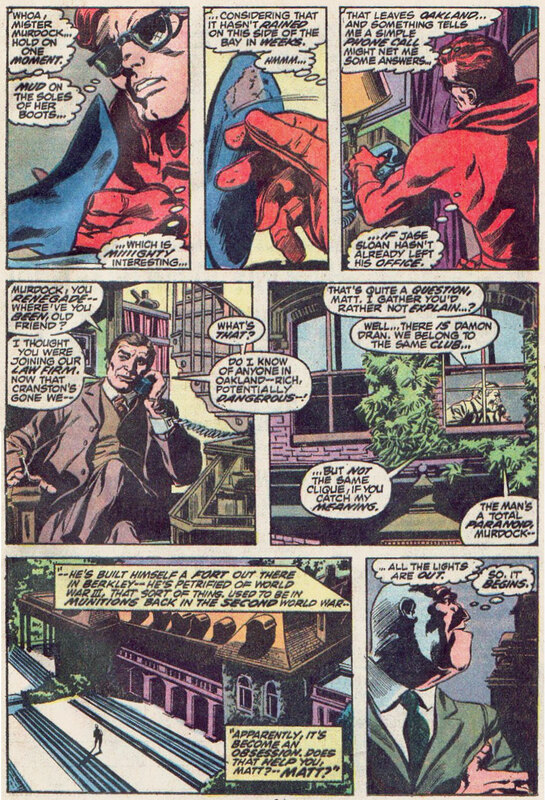 More specifically, the artist Gene Colan. I’m reading Tomb of Dracula comics from the 1970s drawn and inked by Colan and they head and shoulders better than any of his super hero work including Daredevil. Something about horror stories inpsires exceptional work from him. Oh, I know. That’s a subject for another post one of these days (I’ve already covered his glasses, hair-styles, and general fashion…). It seems like it was a taboo for a long time, and maybe there’s also a lack of imagination at play. The most ridiculous case of contrived glasses, though is still that Daredevil Unmasked cover from the Mike Murdock era. As if her would wear sunglasses under his mask, ha ha! Awww, shucks, thanks! Just posted a new chapter early this morning.